A Bassetlaw man who was driving a van with false plates and carrying drugs refused to pull over when a police vehicle drove up behind him, a court heard. The vehicle had its blue lights on when Jack Johnson’s van got in its way, on Common Lane, Harworth, at 9pm, on February 16, said prosecutor Kevin Kavanaugh. When he finally pulled to the side of the road, Johnson admitted he only had a provisional licence, and police found a small quantity of cannabis in the glove compartment. “He bought the van off a friend for £250 and changed the licence plates because he was told it would register as being insured,” said Mr Kavanaugh. Rebecca Williams, mitigating, said Johnson, who had no previous convictions, had been “extremely candid” with officers. He had been sofa-surfing after splitting up with his girlfriend and bought the van to try and find work, she said. Johnson, 19, of Sandringham Court, Harworth, admitted possession of the Class B drug, driving without a licence or insurance, and fraudulently using a registration mark, when he appeared at Mansfield Magistrates Court, on Thursday. He was given a 12 month conditional discharge. 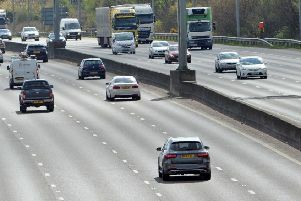 Eight points were added to his licence, but because of a previous driving offence, he was disqualified for six months.